GEORGE TOWN, Grand Cayman — No. 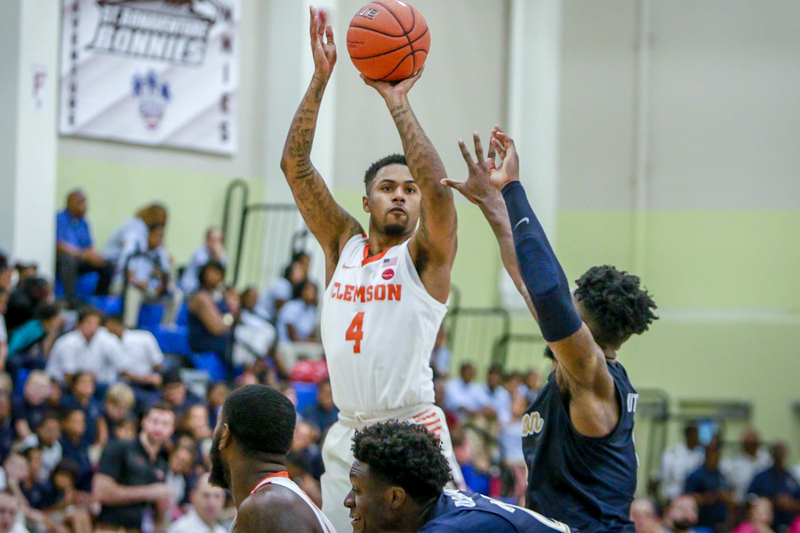 16 Clemson University men’s basketball held off Akron in the first round of the Cayman Islands Classic on Monday morning with a 72-69 victory to advance in the winner’s bracket of the tournament. Clemson will face the winner of Illinois State and Georgia at 1:30 p.m. on Tuesday. Notes: Clemson starts 4-0 for the just the second time under Brad Brownell … Clemson moves to 2-0 all-time against Akron (both games played outside the continental United States) … Brad Brownell wins his 153rd game at Clemson – leaving him four wins shy of passing Bill Foster for second all-time in program history … Shelton Mitchell scored a team-high and season-high 22 points … the total was Mitchell’s sixth 20-point game of his career … Mitchell finished with nine free throw makes –– tying his career best … Mitchell tied his career-best with four steals in the contest … Mitchell’s 15 shot attempts tied a career high … Elijah Thomas notched his 12th career double-double (posted nine last season) … Thomas grabbed a season-high 12 rebounds … Aamir Simms extended his streak of double-digit scoring to four-straight games (three such games all of last season) … Simms also extended his streak of games in which he has hit his first 3-point attempt to four-straight contests.